Discrete Mathematics and Its Applications is intended for one or two term introductory Discrete Mathematics courses taken by students from a wide variety of majors, including Computer Science, Mathematics, and Engineering. 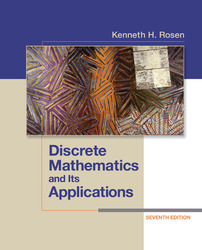 This renowned best-selling text, which has been used at over 500 institutions around the world, gives a focused introduction to the primary themes in a Discrete Mathematics course and demonstrates the relevance and practicality of Discrete Mathematics to a wide variety of real-world applications—from Computer Science to Data Networking, to Psychology, to Chemistry, to Engineering, to Linguistics, to Biology, to Business, and many other important fields. The dependence of chapters on previous material has been minimized to allow instructors flexibility to pick and choose topics. Each chapter is divided into sections of approximately the same length, and each section is divided into subsections that form natural blocks of material for teaching. Instructors can easily pace their lectures using these blocks. Separate chapters on Algorithms, Number Theory, and Cryptography. Expanded coverage of logic and sets, helps students better understand these fundamental concepts using well known examples like Sudoku and Hilbert's Grand Hotel. This edition offers improvements that make the text easier and more rewarding to use. Added to this edition were Margin notes, expanded explanations/details, and revised examples/problems. The Bourbaki's "dangerous bend" symbol has also been added to alert students to topics that require extra attention. The first part of the book has been restructured to present core topics in a more efficient, more effective, and more flexible way. This textbook includes over 3,800 exercises and 750 examples, from straight forward problems that develop basic skills to a large number of intermediate and challenging exercises. Exercise sets also contain special discussions that develop new concepts not covered in the text, enabling students to discover new ideas through their own work. Answers to odd numbered problems are in the back of the book. Worked out solutions for these odd numbered problems are in the printed Student's Solutions Guide (0077353501). Complete solutions for the even numbered problems are available for the instructor only in the Instructor's Resource Guide (0077353498). This edition contains historical information, biographies, & updates on the latest discoveries. The background of many topics are succinctly described in the text using historical footnotes and brief biographies of more than 65 mathematicians and computer scientists who were (and are) important contributors to Discrete Mathematics. Rosen’s writing style is direct and pragmatic. Precise mathematical language is used without excessive formalism and abstraction. Care has been taken to balance the mix of notation and words in mathematical statements. This text has proven to be easy to read and understand by beginning students. There's no mathematical prerequisites beyond College Algebra for almost all of this text, and the few places in the book where calculus is referred to, are explicitly noted. Also available with this edition is MHE's Online Learning Center that features numerous instructor resources including solutions to the problems, an image library, new links to hundreds of external websites relevant to the text material, in-depth explorations of applications, and new lecture PowerPoints for each chapter. You will also find a test bank for each chapter that allows instructors to assign online homework and quizzes - this online homework is gradable and can be edited by instructors.